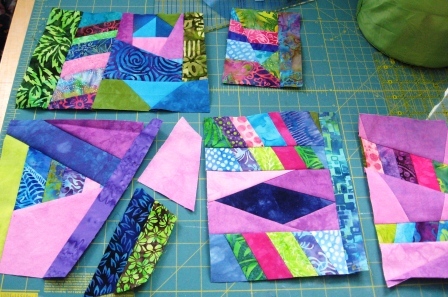 Time for some Poverty Piecing. 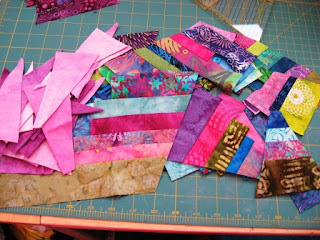 I was shown how to do poverty piecing a few years back by a friend, Lou. 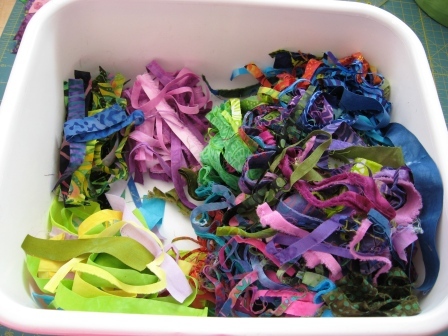 She has made it her mission not to be wasteful and puts all good fabric to good use. 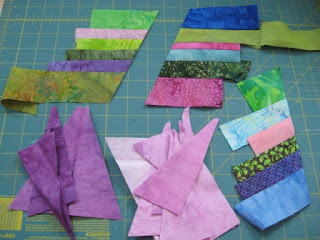 When I started these little blocks, I come up with about a doz ideas. Book marks, Luggage tags, Book covers, Change purse, Needle case cover, Hot pad, Oven mitt cover, Bag of some kind, Postcard with some added embellishment, - Ok so nine ideas so far. We will just have to see how much of this Poverty Piecing I get done. I also have these cut strips. I am thinking hair or weaving or I could trap it under tulle and make something that way. I do love your color choices- they make me smile. Thanks for sharing your poverty blocks.